You are about to take the first step towards transforming your guitar soloing by discovering lead guitar secrets most guitar players will never know about. These 10 guitar soloing tips will enable you to improve your guitar solos instantly by changing the way you think when playing and composing your solos. 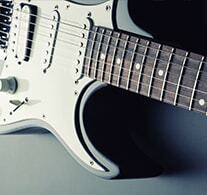 You won't find this collection of free guitar solo tips anywhere else! The secret to making people listen more carefully to your guitar solos. How to become more self-expressive in your guitar solos. How to apply guitar licks that you know to REAL music! How to use speed in 'musical' ways instead of playing meaningless fast licks in your guitar solos. How to use call and response phrasing like the pros do. How to add subtle but critical nuances to your guitar solos, so that listeners are compelled to pay attention to your playing! How to practice your guitar soloing and phrasing in ways that actually work! Get your 10 free guitar solo tips now and learn to transform your lead guitar playing, impress everyone who hears your guitar solos and transform your playing from 'average' to 'AWESOME'! Simply enter your name and email, then click the "Give Me Access Now" button to enter. All of your information is always kept 100% private and confidential.